When WBro Gordon Fielding, the Charity Steward of Concord Lodge 1534, heard about the recent arson attack on Red Lane Primary School he approached the school to see if any help was needed. He learnt that, although much of the damage to the school property was covered by insurance, items such as nativity costumes, P.E. kit, take home bags and the like, which had been purchased from funds raised by the children and parents, were not insured. The school was asked to prepare a list of what was needed which totalled around £4,600. An application was made to the ELMC Grants Committee who awarded a grant of £3,500 which was topped up with a donation of £500 from the Brethren of Concord Lodge. Red Lane Primary School is actually in the Bolton District but, as it is only some half a mile from Radcliffe Masonic Hall where Concord Lodge meets, it was decided that it was appropriate for Bury District to make the application. Unfortunately, on the day that the cheques were to be presented Gordon was unable to attend due to illness but WBro Chris Eccles, the Bury District Charity Steward, was delighted to attend and present the cheques. 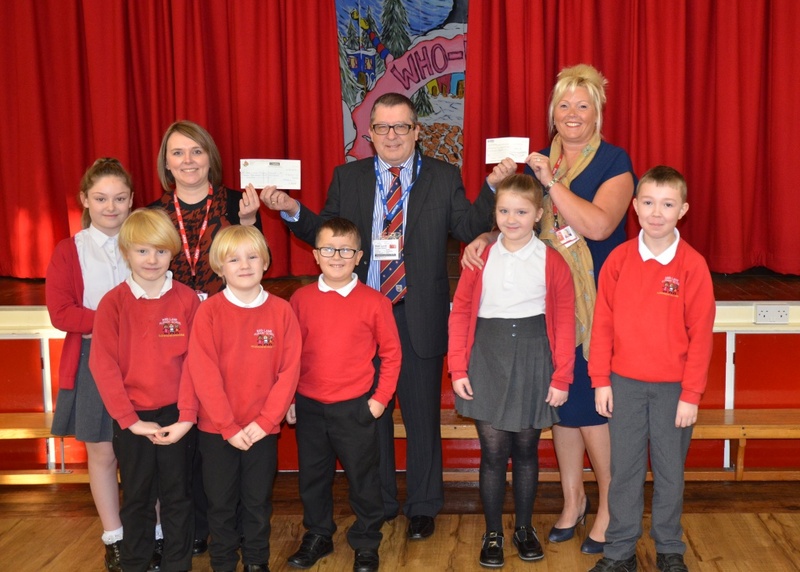 The picture above shows Chris Eccles presenting cheques to the school Head Teacher, Rhian Driver, on the left and Lisa Whittaker, Executive Head, on the right, accompanied by six of the children. The presentation was made at a school assembly when Chris was able to explain to the children where the money had come from and what is was for. Both Lisa and Rhian expressed their most sincere appreciation to Gordon Fielding for the initial approach and to the generosity of Freemasons who had made possible the replacement of the damaged equipment. It was good to know that the school had been able to stage its annual nativity play, in front of parents and guests, due to the Masonic donations.